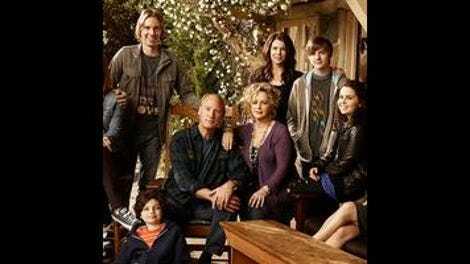 How do you measure a good Parenthood episode? In quality of stories told, or satisfying character moments? In cohesive themes, or number of tears shed? For me, Parenthood is a show that defies any sort of typical critical analysis; my opinions on an episode are often some mutant amalgamation of all the above, which is almost always affected by the way it makes me feel. This is basically a long-winded way to say that “We Made It Through The Night” is kind of a mess—choppy and rushed at times, and beautifully patient at others—but boy, did it make me feel things. And that made me love it. As Parenthood marches toward its end next week it’s much easier for the show to coast by on how it makes you feel, simply because there’s far less story left to tell. Everything is firmly in “wrap-up” mode, which causes a bit of the choppiness that drags the episode down a bit. Chief culprit in this was the Luncheonette plot, which basically comes to a halt here simply because Kristina decides to start a huge fight with Jasmine over Jasmine’s “meddling,” which then becomes a huge fight between Adam and Crosby when Crosby finds out. (Kristina sure isn’t going out in this final season on a high note, is she?) The last thing we see is Adam and Crosby packing up the Luncheonette during a montage, with nary a nice or conciliatory word spoken between them. I suppose it was inevitable that this would happen—Parenthood isn’t huge on people doing things for reasons other than absolute passion, like Adam was doing for Crosby—but it does feel a bit disappointing, after the interesting choice Adam made last week. There’s still one episode left to see where both men end up in their careers, and at this point that could be pretty much anywhere. Also a bit strange and rushed was the Chambers Academy story, which seems as if it existed solely so Kristina and Adam could reassure Max he can make something out of his future, and to show that Kristina actually is making the whole Chambers Academy thing work. Considering the last time we saw anything about the school it was the horrifying story where Max harassed Dylan and Kristina handled it horribly, to see all of her students thriving via montage feels a bit pat and patronizing. This is definitely Kristina’s “end” moment, professionally; the satisfaction on her face as she watches what she created thriving is intended to be fulfilling for her character. It is, or at least it could be, if the entire Chambers Academy plot wasn’t such a disaster from beginning to end. Still, despite those issues the rest of the episode is so heartfelt and emotionally solid that it makes up for those missteps. Key to making all of this work is the wonderful way the show is handling Zeek’s failing health. Zeek’s confession to Camille that he doesn’t want to have the surgery is the perfect combination of scared and settled, and filming the scene almost solely with Camille’s reaction is a gut punch that feels earned. In that moment, Zeek is accepting his impending death and silently begging the person he spent his life with to accept it as well. Seeing that acceptance wash over Camille’s face, and what that means for her, is a perfect moment from Bonnie Bedelia. But the Zeek story doesn’t end there; now it must blossom out to touch the rest of his family, which is where Lauren Graham steps in and basically knocks it out of the park. Sarah’s scene with Zeek where she tells him about her engagement is as affecting a moment as you’ll find, as is her breakdown with Hank when she asks him to speed up the wedding so Zeek can be sure to walk her down the aisle. It’s that wrenching combination of knowing your life will go on when your parents die but desperately trying to speed things up so they’re there for the essential moments, and Graham absolutely devastates. This theme of “life goes on” hits the hardest, though, when Amber goes into labor and gives birth to her son. I like how the writers give Amber a false labor scare to show just how chaotic a Braverman birth can be with everyone in the hospital, then completely backed away from that when it’s time for the actual birth, with only Sarah, Zeek, and Camille in the room when the audience is introduced to the baby for the first time. Amber naming her son Zeek is the ultimate nod to her grandfather, a sign that his life will go on in this little boy even after he’s no longer there to see him grow up. The choice to have it simply be these four in the room—that intimacy—is a good one, and it results in one of the best scenes of the entire series. Interspersed in all of this is the story of Joel and Julia’s reconciliation, and the show handles it admirably, considering the easy thing to do would be to pretend all of their problems would go away simply because they decided their love for each other was more important. But even if their lives go on, now together, it’s not that easy, and thankfully the writers recognize this. The kids might have been happy to see their parents kiss at the skating rink, but them restarting their lives together is far scarier. As Victor rightfully wants to know, what happens now? What if they fight again; will Joel leave? With myriad issues still undiscussed (such as sexual partners while they were apart, or Julia working with her ex) they are forced to retreat to their car to argue the specifics, so as to not alarm the kids. The fact that they’re having the arguments, rather than ignoring them, is the sign that their “end” moment will be together. Life goes on, so you have to figure it out. Even if it means you have to retreat to your cramped car in order to have a serious conversation with your husband. The biggest misstep of the episode was the “Ave Maria” montage, which just reminded me of Aaron Sorkin. Not in a good way. Crosby quitting because what was special about the Luncheonette was working with his brother was heartbreaking to me. All of a sudden, Victor is 30. Stop getting older, everyone! 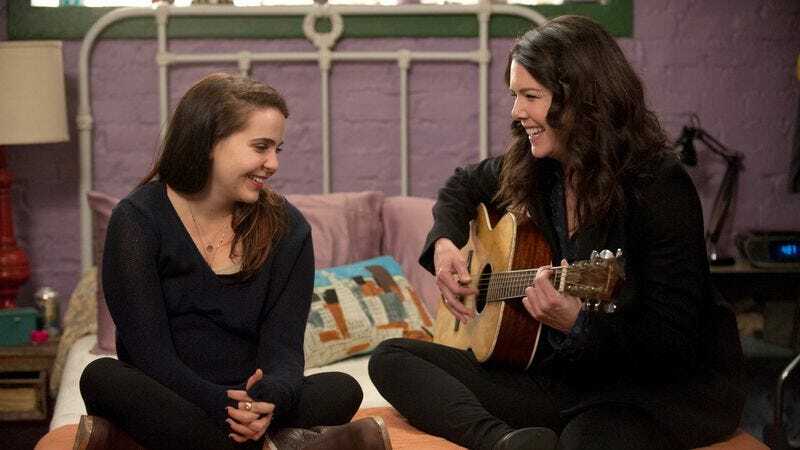 Mae Whitman and Lauren Graham singing and playing guitar on a continuous loop, please.